A CANTILEVER SPAN NEARING COMPLETION. Travelling derricks on either side of the unfinished bridge are shown gradually closing the gap as new sections are built. This cantilever span, 1,400 feet long, is exceeded in length only by those of the Forth and Quebec bridges. 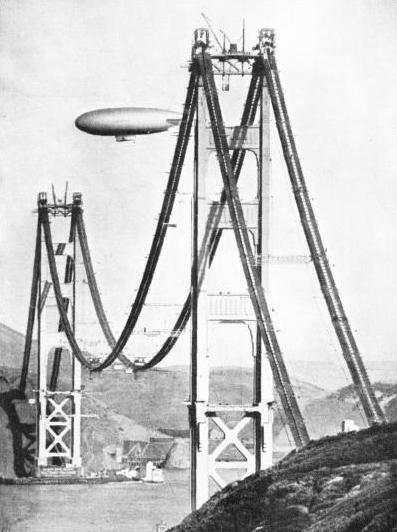 In the background are the uprights and “catwalks” of the Golden Gate suspension bridge in the early stages of construction. IN few lines of achievement has the engineer won greater fame than in bridge-building. The evolution of the bridge is not only one long dogged struggle on the part of man to throw a roadway over a river or a yawning ravine, but also a record of the progress of civilization. Primitive man spanned streams with trunks of fallen trees. Later came the more substantial wooden structures strong enough to bear Caesar's legions. As engineering science developed, wood was superseded by masonry capable of carrying a stream of heavy traffic. To-day the bridge-builder relies on steel. Two outstanding examples of such are the mighty steel pathways which the engineers have thrown across the waters of San Francisco Bay, California. They are the greatest structures of their kind. One of these bridges is the longest in the world. It runs from San Francisco over the waters of the bay to Oakland and has a total length, including its approaches, of eight and a quarter miles, four and a half of which are over deep water. It has demanded an expenditure of nearly £17,000,000, almost twice the cost of the famous Sydney Harbour Bridge. T he other bridge, costing £7,000,000, spans the waters of the Golden Gate at the entrance to the bay. The crossing here is about one and three-quarter miles in width, and the bridge is of the suspension type, with a single arch of 4,200 feet, the greatest of all bridge spans. This new steel pathway links the northern suburbs of San Francisco with Marin County, previously accessible by ferry steamer. Marin County has been aptly called the playground of the people of San Francisco. Here are the Muir Woods, containing the historic redwood trees, which, according to experts, are the oldest living things on this earth. Some of these giants of the forest are 200 to 300 feet high and are declared to be two thousand years old. The crossing is also the key link in the proposed All-Pacific Coast Highway, a great motor road which will run from Alaska down the western coast of North America to Mexico. THE WORLD’S LONGEST BRIDGE in course of construction. A double-decked suspension bridge connects San Francisco with Goat Island, whence the crossing to Oakland is made by a cantilever span, five shorter spans and a viaduct. The upper deck of the bridge carries six lanes of traffic, and the lower is used for trains and tramway cars. The Golden Gate suspension bridge and the other bridge over the waters of the bay, from San Francisco to Oakland, end San Francisco's isolation. The city occupies the tip of a narrow peninsula. With water on three sides, the land exit of San Francisco has always been a bottle neck. True, its inhabitants could go anywhere by water, to the rapidly rising cities on the other side of the bay and, indeed, to all parts of the world; but by land they could go only south. To reach Oakland, Berkeley and Alameda, all growing cities on the eastern side of the bay, a ferry boat had to be taken. The citizens of San Francisco have always been proud of their bay, with its four hundred square miles of sheltered water. Its ferry service has always been most efficient. There was a passenger ferry boat every quarter of an hour during the rush hours between San Francisco and Oakland, as well as a ferry service to Marin County. There were also special ferries carrying motor cars, vehicles and complete trains. In a year 45,000,000 people and 5,000,000 motor cars made use of the ferry service. Thousands of the business people of San Francisco live in the cities on the other side of the bay and formerly crossed by ferry steamer morning and evening. 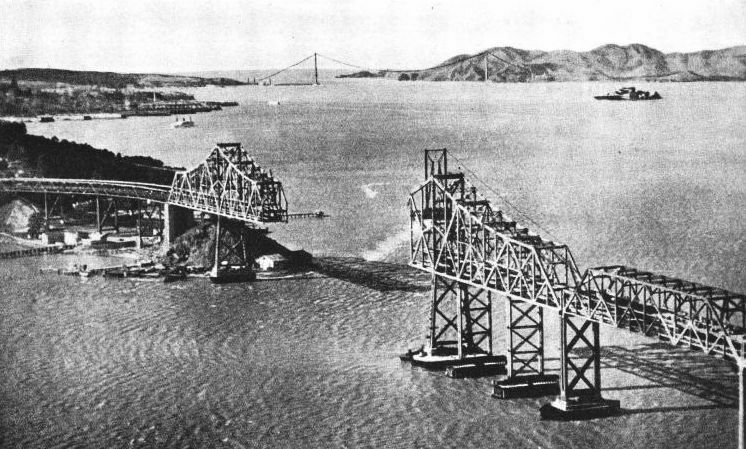 Until quite recently the project of connecting San Francisco with the other cities of the bay by a bridge was considered impossible, because of the great depth of the water, which in places exceeded 300 feet. After a geological survey of the bottom of the bay, however, it was discovered that a high ridge of bedrock extended from San Francisco to Yerba Buena, or Goat Island, lying some two miles out in the bay. This ridge could be used as a stepping stone to break up the length of the structure. True, this rocky ledge lay at no small depth, since it was some 240 feet below the surface, but its presence led the engineers to give serious consideration to the question of building a bridge. It was eventually decided to build a bridge over the water to Goat Island, from which point the crossing was to continue over the water again to Oakland. 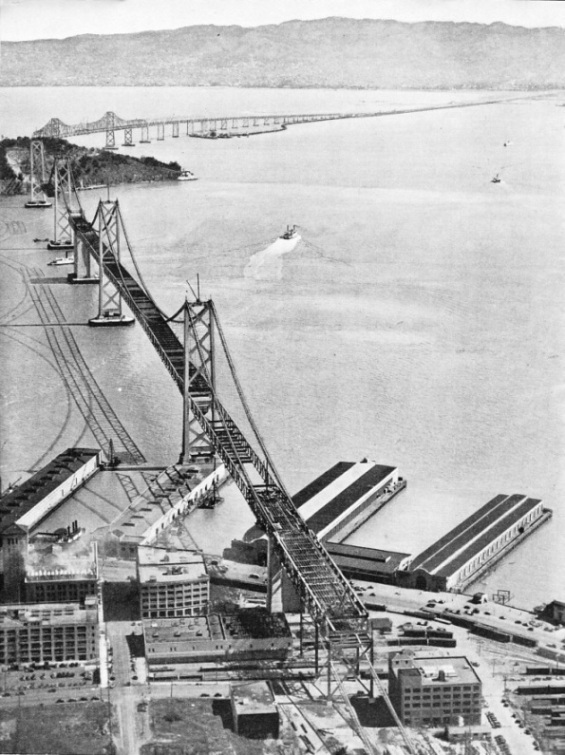 The channel between San Francisco and Goat Island, known as the West Crossing, is spanned by a double-decked bridge of the suspension type, consisting of two main spans, each 2,310 feet in length, and of four side spans each 1,160 feet in length. They are supported by four massive steel towers, standing 518 feet above the water and built up on great concrete anchorages or piers. Goat Island rises to a height of 310 feet above water and has a width of some 3,000 feet. Traffic crosses this island through the largest bored tunnel in the world. From Goat Island the crossing makes a curve, running over the remainder of the waterway eastward to Oakland. One section of the crossing here includes a cantilever span, 1,400 feet long, exceeded in length only by those of the Forth and Quebec bridges. There are five other spans each 500 feet long. The roadway is carried above the water, at a height more than sufficient to clear the masts of the largest vessels. The most difficult part of the whole undertaking was securing the foundations of the piers, particularly those in deep water. There are fifty-one piers in the great bridge, seven of which are on dry land, the remaining forty-four being in the water. The foundations of three of these forty-four subaqueous piers rest on great beds formed by dumping dry concrete from specially-designed buckets into steel cofferdams resting on the floor of the bay. The foundations of thirty-four of the other piers are built on fir piles driven into the soft floor of the bay. Three other piers have cellular concrete bases formed within great caissons, and the remaining four are entirely original in design, and for that reason have attracted the attention of engineers all over the world. An account of the building of the great central anchorage, lying a mile off the shore, midway between San Francisco and Goat Island, gives an idea of the novel and daring method by which the foundations of some of these colossal piers were laid. This particular anchorage is some 500 feet in height, half of it being under water, and it represents a weight of about 300,000 tons. This hollow concrete monolith is taller than the largest of the Pyramids of Egypt. THE CENTRAL ANCHORAGE of the suspension bridge stands on bedrock, 244 feet below the water, midway between San Francisco and Goat Island. Its height above water is 260 feet. The underwater portion of this concrete monolith is honeycombed, tests having shown that a pier so designed is better able to withstand earth tremors and the buffeting of wind and waves than a solid structure. First a great caisson, the largest ever built, was fashioned - a massive timber and steel construction 197 feet by 92 feet in size. Internally it resembled a gigantic egg crate. The "egg compartments" were fifty-five cylinders, or cells, built of steel piping. They were arranged in five rows, and their openings were covered with steel hemispheroids. Air was pumped into these cells to give buoyancy to the structure when it was afloat. The space round the cells and between the walls was filled with concrete, reinforced with a network of steel rods. To the bottom of the caisson was attached a steel cutting edge. The unwieldy contrivance was towed out to the desired site, and elaborate arrangements were made for sinking it. It was first kept afloat by the air within its numerous cells. As it sank, its timber walls were heightened, as were also the steel cells, concrete meanwhile being poured in between the cells and outer walls through flexible pipes resembling huge elephants' trunks. 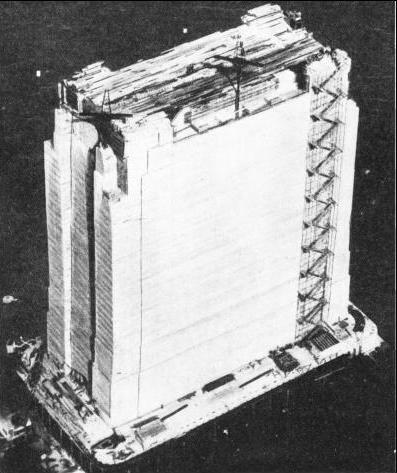 Just before the cutting edge reached bottom, this floating mass represented a weight of as much as 80,000 tons. It was held in place by massive anchor chains and its buoyancy was adjusted by the amount of air it contained. Now followed the most tricky and delicate part of the whole operation. The great caisson had to be brought to rest at the exact spot desired. A diver was sent down to report conditions and to prepare the bottom for the reception of the caisson. Here he toiled with a weight of 80,000 tons hanging over his head. His report being satisfactory, engineers took up their positions, anxiously sighting their surveying instruments on distant points on the mainland. As soon as the caisson was in the right position the chief engineer gave the signal : anchor chains were loosened, the amount of air within the cells was reduced, the cutting edge sank deeply into the mud and the great caisson came to rest. Dredging buckets were now lowered into the cells, and the mud and debris were removed by suction, this work continuing until the cutting edge rested on bedrock. All told, it was found necessary to remove some six million cubic yards of mud, earth and stones to secure the foundations for the piers. This necessitated one of the most astounding diving feats in the history of bridge-building. To seal six of the piers on the West Bay crossing to the rock, it was necessary on many occasions to send a diver down the water-filled cells or tubes to a depth of 240 feet. Only a man of exceptional physique could be employed for such work. The task fell to William Reed, a master diver of twenty-six years' experience. His remuneration was naturally good, his salary being £3,000 a year, with a bonus of four shillings for every foot he descended below a depth of 100 feet. The descent was simple enough, but the return journey to the surface, because of the immense pressure of the water, took six hours. Too hasty an ascent would have brought on the dreaded "bends," an excruciatingly painful muscular contraction that follows a too sudden reduction in the pressure. One of the divers lost his life through too rapid an ascent, which brought on an attack of the "bends." Reed made many descents down the cells of the caissons to report, by the sense of feeling with his bare hands, the existence of any mud, loose rock or other material. Any such material would cause an imperfection in the concrete floor, which was poured down through the cells on to bedrock, forming a bed, ten feet deep, upon which the caissons or piers rested. Despite the arduous nature of his work, Reed came through without injury, although too rapid an ascent on a previous undertaking had cost him an eye. 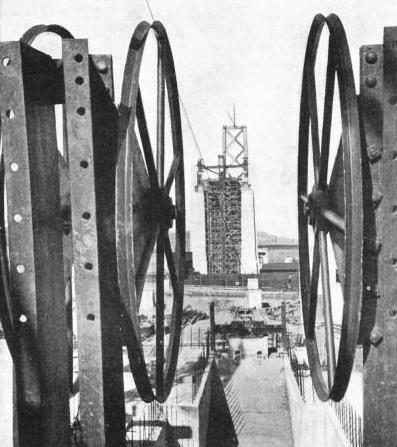 THESE LARGE WHEELS were mounted at the end of the suspension bridge to reel out the cables supporting the roadways. These cables, of nearly 2 ft 6-in diameter, consist of many thousands of wires, each of about the thickness of a piano wire, spun from anchorage to anchorage during the building of the bridge. 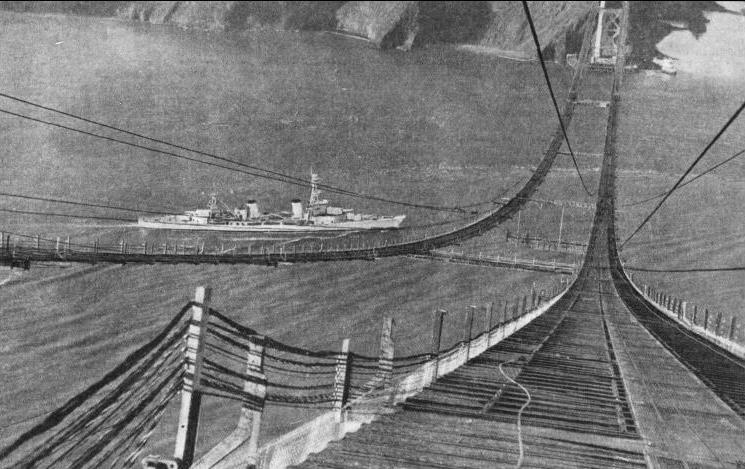 Each cable weighs 18,500 tons, and about 70,000 miles of wire were used in the building of the suspension bridge between San Francisco and Goat Island. Strangely enough, Reed declares that his most hair-raising task was not concerned with the 240-feet descents in the cells or in open water, but was one which he made on the east-bound crossing, where the water was comparatively shallow: yet it proved to be one of the deepest dives of the undertaking. "Though the water was only about 40 feet deep," he writes, "we had to go down more than 200 feet to reach a solid foundation for this particular pier, which had to carry one end of the long cantilever span. The caisson was of the false-bottom type, and after it had hit the mud the false bottoms were ripped out, and the mud pumped and dredged out until the hole in the bottom of the bay was about 200 feet deep. It was my job to go down into that water-filled hole, 245 feet under the surface. It was the blackest place on earth, and although we divers have got used to working in inky blackness, and depend solely upon a sense of feeling, I was not sorry when the job was done and I could give the signal to be hauled up slowly to the surface." After the caisson at the anchorage had reached bottom, and the mud and debris had been removed, the cells were plugged with concrete to a depth of 34 feet. Above this height they are hollow; or, rather, they contain water which is allowed to flow in. Above the water-line the walls of the pier are 14 feet thick, and into these are bolted the cables which carry the roadway. This great pier has a total height of 504 feet from bedrock, 260 feet above and 244 feet below water. The underwater portion of the pier is partly honeycombed with forty-three 15-feet circular cells. This form of honeycombed base was resorted to for several reasons. Scientific tests have shown that piers so designed are better able to withstand earth-tremors and the buffeting of currents and waves than if they were entirely solid. To prevent damage through ships colliding with them, the piers are protected by massive fenders, and at various points along the route of the bridge enormous bells have been placed. These are made of cast bronze, and are capable of throwing their warning note a mile away. Upon these concrete piers or bases rise the giant steel towers, from which the roadways are suspended. They are built of the finest structural steel, and their erection was no small undertaking. Every care was taken to avoid accidents. Men were carried up and clown the steel pylons in specially protected cages. The heated rivets by which the great pieces of steel were fastened together were delivered to the workmen through metal-lined air hose. The rivets often reached the riveters, particularly those toiling at the top of the towers, hotter than when they left the forges. This is due to friction. The towers carry the cables, which in their turn hold up the roadway. Thus the towers or piers have to be strong enough to support the cables, and the cables must be capable of sustaining the load upon the bridge. The cables consist of thousands of wires, not much thicker than an ordinary piano wire, spun from anchorage to anchorage by means of spinning wheels. The wires are woven into strands, and when these strands are bound together and bolted firmly into the eye-bars or sockets at the anchorages on shore, they are strong enough to support an enormous weight. Before the cable can be placed in position, however, a temporary pathway, known as a catwalk, is strung from tower to tower a few feet below the, path which the cable will follow. This enables the men to control the spinning of the wire, and provides space for the apparatus and machinery necessary for driving the wheels and binding the finished strands into a single cable. Back and forth runs the wire over the spinning wheels, work that occupies many weeks for a large cable. The cables which support the San Francisco-Oakland Bridge are 28¾ inches in diameter, and are composed of 37 strands, each strand consisting of 17,464 separate wires. All told, there are over 70,000 miles of wire in the cables, almost sufficient to encircle the earth three times at the Equator. There are two cables, one at either side, and each is capable of exerting a pull of 18,000 tons upon its anchorage. They are attached by eye-bars or sockets at the shore anchorages to great steel frames embedded in concrete. Each cable is anchored in masses of 68,000 cubic yards of solid concrete. The cables alone represent a weight of 18,500 tons. AERIAL PATHWAYS, suspended between the two towers of the Golden Gate suspension bridge, which has a span of 4,200 feet. Work on this bridge was exceedingly difficult because of the gales which sweep across this exposed stretch of water. Heavy masses of metal had to be lashed down, and articles weighing half a hundredweight were often tossed into the air by high winds. As every one knows, steel expands in the heat of the sun. It was found that the 500-feet towers were liable to bend in one direction in the morning sun, and in the reverse direction in the afternoon. The amount of the bend was about six inches in one direction and about eight inches in the other, and allowance had to be made for this. Calculations also showed that a tower is liable to bend over as much as three feet when fully loaded, and the deck may sway several feet from the force of the wind. The decks are attached to the piers by rocker arms to allow for this movement. As traffic travels across the bridge the pull on the cables causes a wave to roll on ahead, creating a slight "S" formation—raising the deck ahead and depressing it underneath the vehicles. The deck can be lowered by as much as eight feet without causing danger to the structure or even attracting the notice of passengers. The bridge carries two decks, an upper one 58 feet wide, providing six lanes for motor traffic and a lower one reserved for trains and trams. San Francisco's other bridge, across the waters of the Golden Gate, is equally entitled to recognition as a daring and remarkable structure. The opening here is being spanned by a steel pathway 6,450 feet in length, with a clear span of 2,400 feet. The greatest of all bridge spans, it is 700 feet longer than that of the George Washington Bridge, in New York, which has hitherto held the record in length of span. T he task of securing the foundations for the two piers, upon which rise the great towers that carry the cables, proved arduous. Coffer-dams, or caissons, huge wooden and steel boxes without tops or bottoms, were sunk upon the desired site, some little distance from the shore. When they came to rest upon the sea bottom, the water was pumped out, and men descended to remove the mud and debris until the bare rock, upon which a firm footing could be secured, was reached. The piers are of concrete, the south pier being the larger. It measures 90 feet by 185 feet, is 144 feet in height, and weighs 130,000 tons. The north pier is much smaller, and weighs about 50,000 tons. THE VAST STEEL TOWERS of the Golden Gate Bridge rise to a height of 746 feet, and are 121 feet wide at their bases. Some of the steel members which had to be lifted by cranes and bolted into position weighed as much as 80 tons. The U.S. army airship T.C.13, flying over the unfinished bridge and dwarfed by its great proportions, is 250 feet long. She is one of the biggest non-rigid airships in the United States. Upon these piers rise lofty steel towers. They are each 746 feet in height and 121 feet wide at their bases. They are over twice the height of St Paul's Cathedral, London, and four times as high as Nelson's Column, in Trafalgar Square. Each tower consists of two steel posts, built up of a series of rectangular cells decreasing in number from ninety-seven at the bottom to nineteen at the top. Horizontal struts and diagonal bracing firmly connect the two posts. Some of the pieces of steel which had to be lifted by cranes and bolted in position weighed as much as 80 tons. After the steel work had been completed, the two great cables which carry the roadway were erected. They are each 36½ inches in diameter, weighing 11,000 tons, and are some 7,660 feet in length between the anchorages. Each cable is made up of 61 strands, and contains 452 wires one-fifth of an inch in diameter, making the enormous total of 27,512 wires in each cable. In the two cables there are over 80,000 miles of wire. The cables are capable of supporting a load of over 100,000 tons, more than twice the weight which the bridge will be called upon to carry. The auxiliary cables, by which the bridge deck is suspended from the main cables, are 2⅛ inches in diameter, and have a maximum strength of 500 tons. The roadway, carried 200 feet above the water-level, has a width sufficient for six lines of traffic, and is flanked on either side by a pavement 10½ feet wide. The great bridge is notable for several interesting innovations. Provision has been made for floodlighting the towers and outlining the cables in lights for their entire length. A lighthouse station surmounts the tower on the San Francisco side of the bridge. 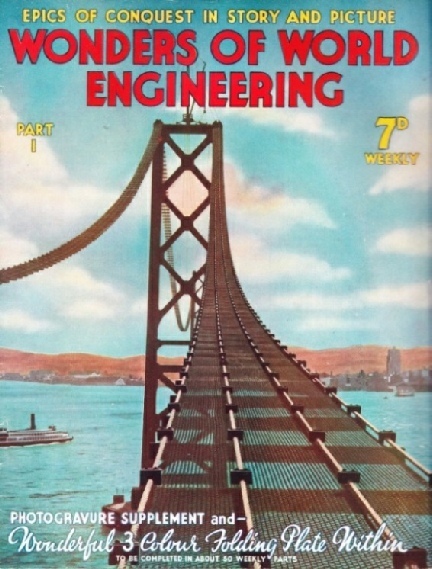 The cover to part 1 shows the Oakland Bay suspension bridge under construction. At this time it was the world’s longest bridge. Its construction is described in the article reproduced above.